Darlings, as you probably all know by now, the blogosphere is full of amazing people whose daily posts make each day bright and sparkly. Melissa Blake of So about what I said… is one of those very individuals. Alongside my coffee every morning is not a slice of buttered toast, nor a bowl of cold cereal; rather, it is Melissa – or, more specifically, her witty slices of wisdom. Thus, I was thrilled when we decided to guest post for one another. This past Monday my piece entitled The Bag vs. The Boy appeared on So about what I said…; and today, Melissa’s words appear right here in the form of Garage Sales Are the New Bloomingdale’s - the absolute perfect way to kick off the month of May, and garage sale season. Enjoy kitty cats! The brightly colored signs have been placed on street corners all over town, with arrows pointing to that special house down the street. People have scoured and streamlined their garages, turning their driveways into storefront windows, ready to turn a profit on their once-treasured possessions. Even kids get in on the action, sometimes setting up cute little lemonade stands out front to offer passersby a refreshing drink. On a sunny afternoon walk recently, I saw these signs sprouting up all over the place. One thing was clear: Those neon signs were meant to make a statement. And a bold one, at that. Welcome to Garage Sale Season. One gander online, and it didn’t take me long to get an inside peek into the world of garage and yard sales. This is no longer a “let’s-throw-a-garage-sale-on-a-whim” sort of thing like it used to be in the olden days. People have now made this into a sort of cutthroat business. Hard-core sellers even devote Web sites and blogs to logging what they’re selling and how much they’ve made. But then it hit me: In these tough, cutthroat economic times, it makes perfectly good sense. Sort of brilliant, actually. Garage sales (and let’s not forget one of my favorite shopping hot spots, The Salvation Army – site of my 15-polo-shirts impulse buy last May) are the new Saks and Bloomingdale’s. And seeing that the dawning of Garage Sale Season is only beginning, I can’t help but wonder: These times may be tough, but does that mean we still can’t be the epitome of a stylish recessionista fashionista, especially with the help of our neighborly garage sales? I’ve long been a fan of the classic garage sale. Thanks to my mother, it’s always been one of my favorite outdoor adventures. I imagine it’s much like those sprawling New York City flea markets, only on a smaller scale and with the trademark Midwestern charm. For years, my mother and I spent a lovely sunny day strolling all through area neighborhoods. We just took our time (one advantage of garage sales: No heavy crowds to battle like those big-city flea markets or one of those gigantic warehouse stores), walking around and browsing each table in every garage. My mother, of course, took her time and was usually distracted by all the books and CDs – the CDs usually being of the Broadway songs or Christmas songs variety. “What about this one?” she’d ask, handing me a gem of a CD for 25 cents. “That looks good,” I replied. I couldn’t help but notice how cute, bouncy and happy she looked, her smile growing brighter with each new find. We’d eventually comb the entire neighborhood, usually having to stop and rest at one of those lemonade stands (Those kids, I’ll say, were very business savvy), and walk home with at least one new book (usually a medical book to add to my mother’s collection) and a few CDs (again, usually one of Christmas tunes to add to my mother’s collection). Last year, I even scored the most beautiful shot glass. For free. I think of the lovely lady who gave it to me every time I do shots of apple juice to drown out my economic woes. That’s the beauty of garage sales. They’re like a huge block party, reminiscent of something you would have seen in 1950’s suburban America. Not only that, but you can find anything your little heart desires. Literally. Garage sales are huge ebay auctions, only in real-time and with better prices. Out-of-print. Out-of-stock. Out-of-style – if you search enough garage sales, I guarantee that you’ll find what you’re looking for. Somewhere in someone’s garage. Beanie babies. Barbie’s and action figures from the 1980s. Classic Danielle Steele novels. And who could ever forget that childhood favorite – the Etch-a-Sketch. It’s all ripe for the taking. Besides, even if you’re not in the buying mood (and if you’re not, I suggest you seek medical attention immediately; my mother could very well have a book that could help you), it’s worth garage sale-ing (and yes, I just coined that verb myself) for the sheer excitement of the experience. It gets you outside, interacting with people, getting to know your neighbors (and what their wares say about them). And you never know, you might just find that elusive shot glass to complete your collection. Finally. Maybe you’ll even get it for free, too. Remember, what’s one man’s (or woman’s) trash is indeed another man (or woman’s) treasure. Get out there and find those treasures today. And while you’re at it, buy a glass of lemonade from those cute kids too. Thank you to Melissa for this post. Happy, Happy Saturday Shopping, my loves! Awesome post! I love garage sales and it seems like me car has the ability to drive right to them! Garage sales have become a little crazy down here. I mean, if you're not up and running by 7 AM, then forget it. The person down the street has made all the sales. Last time I had a sale, I learned that anything on the porch is up for grabs, including my plants! Vintage is always chic! 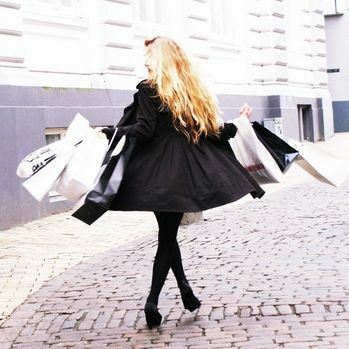 What fun shopping for the Recession-ista! I love your guest post exchange, what a great idea! Hope your weekend is restful and fantastic, Erika! I've yet to go to a garage sale... or Bloomie's, now that it's out there. i went by a garage sale today actually! it definitely is very in, and in this economy everyone wants a good deal!! sweet! Yeah, in June sometime in Iowa is this big garage sale that goes for miles. I have a friend who bought everything for her apartment at an Estate sale. She made some really cool deals. I loved going to garage sales back in the day. I still browse thrift stores, but garage sales are not as abundant where I'm living. I remember loving garage sales when I was like 6. I would go with my mom and buy the most random office supplies like post it's and index cards. All of my friends laugh at how excited I get when I see a garage sale now. They are like a treasure chest! I haven't hit up garage sales in sooooo long. You can definitely find some gems at those things! I love this post! I'm literally the BIGGEST fan of garage sales; they're one of my favorite things about summer! so cool. I love going with my friends to garage sales. you just never know what treasures you might find. i love garage sales, just wish there were more of them in sweden! Lovely guest post! I really love your blog, and I've been reading it for a while. Great guest post! 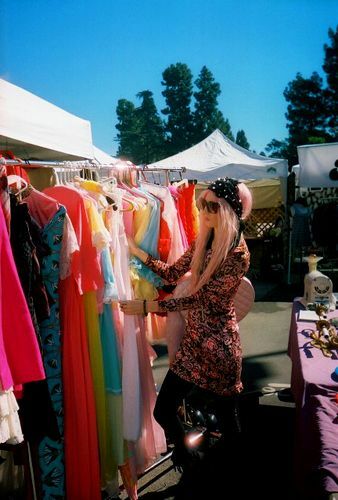 Garage sales, thrift stores, flea markets are the best! You can find a lot of fashionable things at those places that look the same as the things you find at retail stores! Thanks for bringing this to the limelight! i used to buy from garage sales more but i usually dont see as many good ones anymore. theres nothing wrong with buying stuff from garage sales. you never know if you'll find a treasure. Great post! Whats great about being here in Alaska is their love of thrifting and garage sale-ing which happens to be my love too! Lovely guest post!! Erika, you have a whole bunch of friends who write as well as you do! such a cute guest post! garage sales are so nostalgic. i need to get myself to some soon, its been ages! thanks to sarabbentley for introducing me to you and you for introducing me to so about what i said. love you guys for what you do! Someone's trash is definitely someone elses treasure. I love garage sales and markets. You always find such adorable unique things. utterly amazing post; I've never come across a garage sale over here, I wish it'd catch on! This reminds me I need to have a tag sale asap! Great guest post! I've actually never been to a garage sale, although they are quite common around here. I guess you never know what goodies you might find! I'm a fan of garage sales! if you're in a trendy neighborhood its even better. ie west hollywood,beverly hills etc. i used to get up at the break of dawn, search craigslist and map out all the nearest ones. I once hit the jackpot in west hollywood. A woman just had a baby and wanted to get rid of her size 4 BEBE, BCBG, CLUB MONACO work clothes...I must have left with at least two bags of goods! all for $30 :D IT'S sooo FUN! It really does make sense to have garage sales in these times, I totally agree. There are always fun treasures to be found too. I am impressed! Blog message posted here is surely my friend. I justifiable want to hint safeguard up with comments and nobility work. IE browser bookmarks to your blog at best now, I l be involved a arise pursuing to fathom my friends more in the future! The color of the layout is not bad, it is mild on the eyes.